TODAY South Africa's Deputy President Cyril Ramaphosa will address the World Aids Day Commemoration in Daveyton, Gauteng. 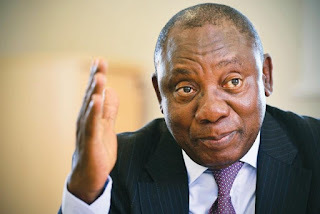 Ramaphosa will be joined by Minister of Health Dr. Aaron Motsoaledi, SANAC Deputy Chairperson Steve Letsike, Premier David Makhura and MEC and representatives of civil society. In his message ahead of the commemoration, Deputy President Ramaphosa said "As we approach World Aids Day on 1 December, we are inspired by the many actions taken by South Africans from all walks of life over many years to fight AIDS. Thanks to your efforts, we have the biggest HIV treatment programme in the world, with nearly 3.5 million people on life-saving antiretrovirals. "We are bringing care and treatment of TB to the doorstep of vulnerable populations in correctional services and mining towns. 'Today, South Africans are living longer and more productive lives. Fewer people are dying from AIDS and TB. We have dramatically reduced mother-to-child transmission of HIV. "This has been made possible because all of us have worked together. 'We have risen to the challenge. We are acting in various ways - big and small - to spread information, fight stigma and promote healthy lifestyles. But the fight against HIV and TB is far from over. "The rate of new HIV infections is still extremely high. Of particular concern are the high rates of new HIV infections among adolescent girls and young women. As we expand our treatment programme, we need to make prevention of HIV transmission a critical and immediate priority. "We have no choice. We must act now to stop the spread of HIV and TB. We must preach and practice responsible sexual behaviour. This means using a condom during every sexual act. It means not having multiple sexual partners. It means getting tested regularly. "It means working together in communities - as individuals and organisations - to combat stigma and discrimination. We will not overcome these diseases unless we work harder to overcome the economic and social problems that fuel the spread of these diseases. "We must ensure that all South Africans have shelter, food, water and decent sanitation. We must strive for gender equality in the home, in the community and in the workplace. We must stop violence against women and children. "We must create a society in which people are able to take responsibility for their own wellbeing and the wellbeing of those around them. We call on all South Africans to play your part today and every day. The future of our country depends on you.